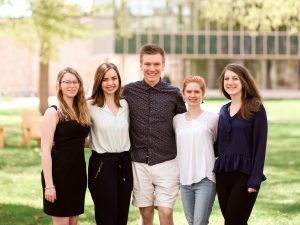 Five of the six 2018 Fulbright recipients. Pictured from left to right: Olivia Sullivan, Alexandra Hunt, Timothy Bergeland, Anika Hodel, Olive Dwan. Click here for more information. St. Olaf supports undergraduates and graduates in exploring and applying for nationally competitive scholarships and fellowships. There is a wide range of opportunities, so come explore which programs best meet your intellectual, professional, and personal goals. Wherever you are in the process — from just beginning to think about whether a scholarship or fellowship may be right for you to finalizing your last few words before pressing submit — we are eager to support you along the way. Are you interested in pursuing a nationally competitive scholarship or fellowship? We are committed to guiding you through your respective application process. Outlined below are the steps to get started. Take a look at our nationally competitive fellowships (including those that require institutional endorsement and those that are direct apply) and familiarize yourself with those that are of greatest interest to you. Nationally competitive fellowships may also be explored by class year of eligibility. Whether you are interested in exploring fellowship or scholarship options, or are finalizing last steps to your application, don’t hesitate to make an appointment. If you’re interested in Fulbright or the Critical Language Scholarship, contact Professor Heather Campbell, Co-Director of External Fellowships and Scholarships, in the Education department. If you’re interested in Boren, Gates-Cambridge, Marshall, Mitchell, Rhodes, Truman, or Udall, please contact Professor Kathryn Ananda-Owens, Co-Director of External Fellowships and Scholarships, in the Music Department. The Writing Desk: Writing, revising, and providing feedback on your personal statement and project proposals.